A Jacob's ladder... properly known as crepuscular rays. The light shone on Kuroji and Yaorochi as they stood on the chamber's roof. Kuroji: "An 'imperial treasure'... you say? Well, you were pretty strong, but you'd have to be way more than just delusional to call it one of those." Yaorochi: "Ridiculous! This can't be...!" Kuroji: "Oh, my word. Now you're going and saying lines fit for a petty underling." 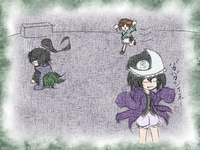 Kuroji shrugged, muttering "ooh, so scary," and turned away from Yaorochi. 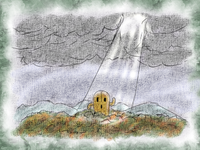 At the same time, a loud voice could be heard from afar. Kuroji: "...Wow, Yaorochi-san. Even your allies are calling you a scoundrel." Yaorochi: "They obviously mean you." Sukune: "Oh, Yaorochi-san's here too, nyo... wait, aaaah!! That's m'bottle opener! Did the ritual finish'n everything?!" 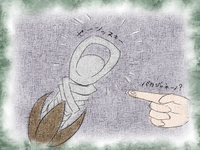 Kuroji: "A bottle opener? ...You mean this sword?" Sukune: "That's not a sword, gyah. It's m' sword-shaped bottle opener! Look, there's a bottle opener on the handle, y'see?" Kuroji: "It seems to be clear, now, that this story was put together by an idiot." Sukune: "Y-Yaorochi-san! Are y' alright, chuu?! Hang in there, nyah!" Kuroji: "They just crumpled right to the floor. Ouch." Sukune: "You're so annoying! Ya scoundrel!" Kuroji: "Oh, honestly. And here, I was about to go get them some water and everything." Sukune: "Y-You're so nice! Ya scoundrel!" 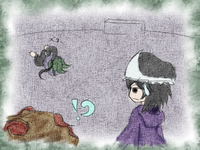 Yaorochi: "You're so cruel, you scoundrel..."
And thus, the incident was resolved(?). as a bottle-opener, the sacred treasure couldn't display its original power. so in the end, Kuroji had just left a trail of destruction and corpses in their wake for no reason. had harmed... (by which I mean some debt collector, mostly). In that sense, Kuroji's actions could be described as significant. ...Well, that's how Kuroji decided to think of it. ↑ These highlighted in grey were removed in v1.10a. This page was last edited on 11 December 2017, at 17:20.